If you are want to know the story behind this photo, here goes: several weeks ago I was at the grocery store, and while loading the bags into my car I took out a bag of my old records to take a look and put them on the roof of my car, but forgot to put them back in. I pulled out onto the highway and 50 yards later I hear a thump and looked back to see my bag of vinyl bouncing off the road. An instant later an 18 wheeler slammed the bag and records went flying, bouncing, and rolling all over the highway. I pulled the car over immediately and turned on my flashers and ran back to pick it all up. As I was running back, a van hit another few pieces of vinyl. I ran into the highway, picking up piece after piece when the path was clear. Cars were flying by, and I was running on and off, on and off the highway. More pieces were run over, more pieces were rolling around. Crazy! After about 3 minutes (I think) of this pandemonium I had gathered all my vinyl. I drove home in relief and on the way back, stopped at a remote intersection to assess the damage: everything was in one piece! 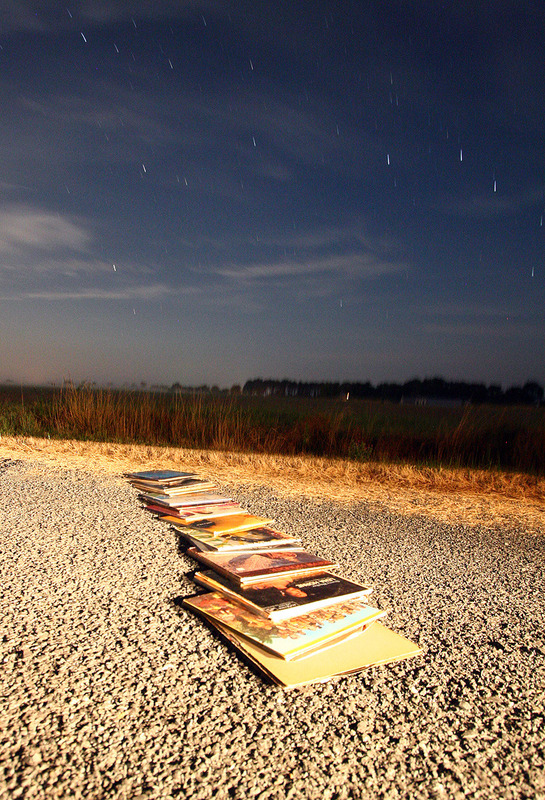 I took out my camera and laid a few pieces of vinyl on the ground and proceeded to take this picture under the stars. That bag of vinyl included Miles Davis, Lena Horne, Duke Ellington, Ella Fitzgerald, Billie Holiday, Stevie Wonder, DJ Spooky, Ziggy Marley, George Harrison, some local rappers, and a bunch more. Basically, my most treasured vinyl. My flight to China was canceled due to bad weather, which as given me the chance (at this moment) to burn those records to my computer as MP3s (w/ a USB turntable) so I can use it to sample and make music in China, on my last night in America. wow…it must be fate–they must be listened to! omg..this is an amazing story. that would never happen in LA because the freeways are always jam packed or cars just fly by second by second. that’s a relief! no one got hurt and your vinyls are still in one piece! what’s with that new photo of you. it’s a hoot! Hey Jesse, great final image and story to leave home with. I guess you’ve been back in China for a little while already? It looks like you had some fun while you were home though. My photography job here is OK, not great but it beats virtually anything else I could be doing here. The way I see it, it’s only a stop on the way to much bigger and better photography gigs anyhow. I’ve been saving and saving waiting for Canon to release my ultimate camera, and with the announcement of the new ones, still nothing I really want. I’m still leaning toward the 5d though, so with Nikon’s full frame announcement, Canon’s has to drop the price soon. Anyway, keep up the great posts and the creativity. I’m glad you stuck with the hobby, since you’re a natural! shucks, still no xanga access in china huh?